NYC Educator: Where Would Martin Luther King Jr. Stand? My blogging buddy Reality-Based Educator has a post about MLK and economic justice. He mentions that the charter school moguls would have you believe he'd support all their nonsense about privatization and union-busting. "For the children," supposedly, MLK would have them not only abandon the concept of union, but also support billionaires like Bloomberg and Gates as they attack the pensions, salaries and working conditions of the middle class. Supposedly, he'd support them in their efforts to destroy the teaching profession, one avenue for many to said middle class. "In our glorious fight for civil rights, we must guard against being fooled by false slogans, such as 'right-to-work.' It provides no 'rights' and no 'works.' Its purpose is to destroy labor unions and the freedom of collective bargaining…. We demand this fraud be stopped." 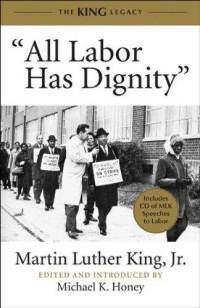 "The labor movement was the principal force that transformed misery and despair into hope and progress. Out of its bold struggles, economic and social reform gave birth to unemployment insurance, old age pensions, government relief for the destitute and, above all, new wage levels that meant not mere survival, but a tolerable life. The captains of industry did not lead this transformation; they resisted it until they were overcome." -- MLK Jr., Illinois AFL-CIO Convention, 1965. Let's respect his legacy. Let's not allow demagogues and ignoramuses to urge us back to those days. Even this week, Andrew Cuomo is airing ads promoting his anti-union vision for the future of New York. Let's give Andy a call and let him know how we feel. Next Wednesday there's a PEP meeting at Brooklyn Tech. Next Thursday night there's a hearing to once again try to close Jamaica High School based on blatantly false statistics. None of us can be what MLK was. But this week we have several chances to stand up, just as he would, to those who'd destroy us to further enrich their rich friends. I'll be calling Governor Andy, and at Jamaica for sure.